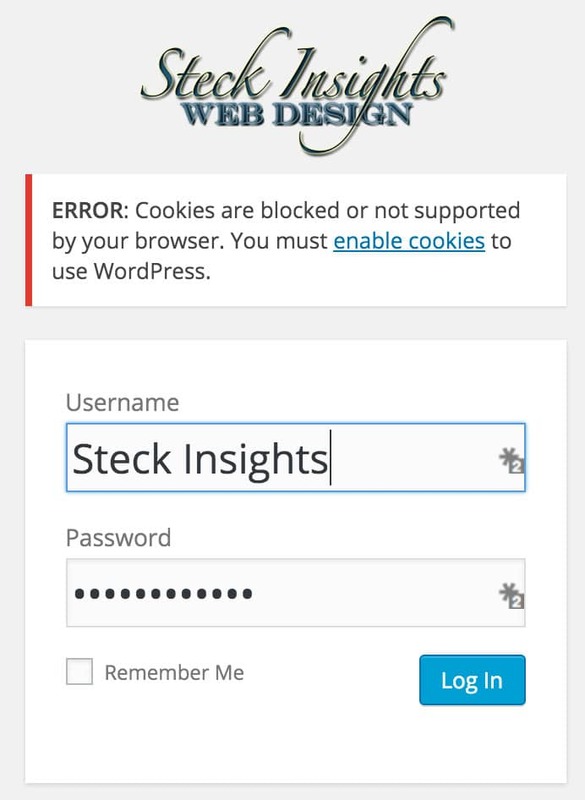 If you have a caching plugin installed on your WordPress website, chances are that you will experience a “Cookies Blocked” error message while trying to log into the WordPress admin dashboard at some point in your life. I’ve seen this since we begin implementing caching and security plugins more heavily on our websites. Honestly, I haven’t narrowed the problem down to the point where I know exactly which plugin or setting is causing the issue. I have, however, found two quick methods for how to fix a “cookies blocked” error on WordPress admin dashboard. I don’t believe the problem is actually that cookies are blocked by your browser — I use Chrome for Mac and cookies are not being blocked. I think that WordPress is looking for a test cookie, which is being blocked or not shown by the caching plugin. Could be wrong here, but that’s my current theory. 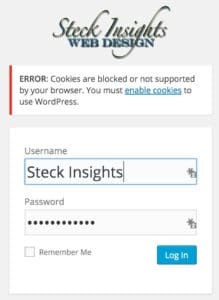 I read many forums where people described elaborate methods of getting into their WordPress admin dashboard after seeing the “Cookies Blocked” error message. Some people uninstalled and reinstalled WordPress, reinstalled all their plugins, paid wild amounts to developers, etc. If you’re just trying to get into your site in a hurry (drumroll please)… hit refresh. I’ve been able to get into every one of my website dashboards after seeing this message, simply by refreshing the browser. Somehow, the cookie that was missing is then picked up and you are allowed in. Voila! I’m not seeing the error any longer and I expect that you’ll have the same result. That said, I don’t believe this “solution” is even an actual “permanent fix” because, really, the only fix is for either the plugin developers to adjust their code, or WordPress to acknowledge this and make an adjustment for it in the core. Currently, I’m on WordPress 4.4.2. Maybe we’ll see this fix unnecessary in future updates.